I think part of why I love photography is I am able to be so engaged in seeing God’s creation and sometimes just standing in awe at how creative HE truly is! I sacrificed a lot for this image…waking up at 5:15 am…yes you read that right A.M.! Throwing on some descent clothes, grabbing my camera gear, a beach chair and towel. Getting to the beach at 5:40-ish for the sunrise to be at 5:49am that morning. Little did I know the sun was on the other side of the row of hotels and condos…that thought never even crossed my mind when I planned this get up! Oh well!! As my friend and I were pretty much the ONLY people out there (besides two other photographers waiting to photograph families…my oh my what were they thinking!!!!) I put my fish-eye lens on just for fun…as I began to look through the images I knew this was going to be my favorite! For me this one became frame and wall worthy! Katey - My favorite place in the south!! 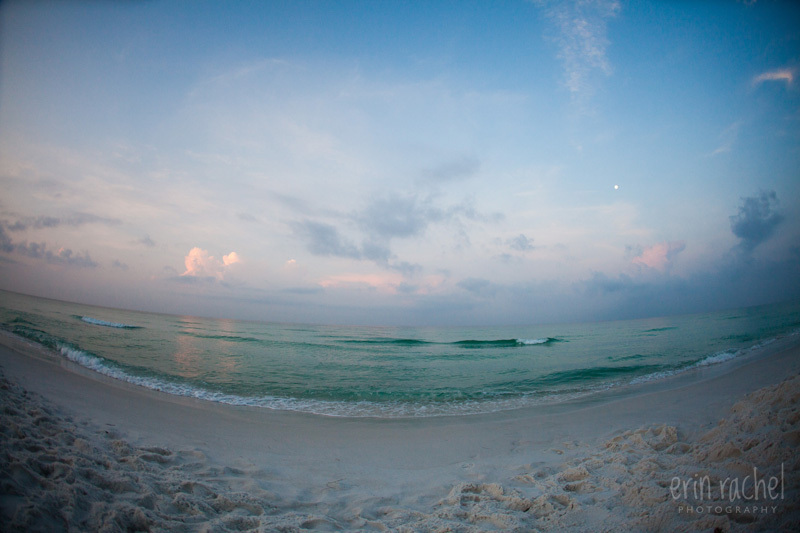 I so miss Destin, FL!! Great picture! !